shown alongside a Korejanai robot. Photo provided by Hoya Corp.
Really, I simply ignore all the doom and gloom posts about Pentax going under. Then I see this post and wonder, is this what pentax has been reduced to? I blurted out in laughter when I first saw this image. Reply from stanton11 on Pentax Reduced to this?? with your black, loud clacking scare-bird photography unit. I'll be in stealth mode with my rainbow k-x. I have my utmost support and a big bravos to stanton11. I wish I can find stanton11 flickr account information so that I can make a contact with stanton11. It is a good lesson to be learned that not all people think alike. And there is a good reason for the Korejanai K-x. 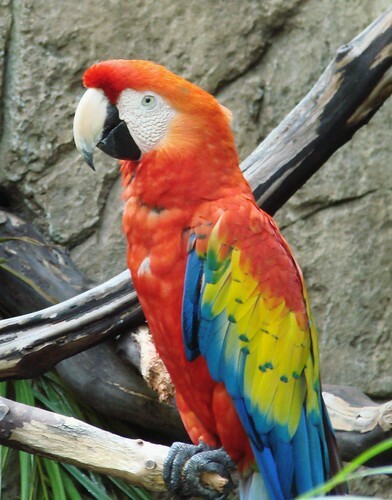 The most humorous that we can draw from the scarlet macaw with a black camera and that of a colorful Korejanai K-x will be along the line of the reaction from the Macaw. As for HinTheMan, I am more decided to get Pentax K-x white one first while waiting for K-7 to come down in price. I wish I can get the white K-x with a red handle but the default white K-x with a black handle will do fine for me.